Every Australian school child should know how to play handball, a game that is easy to learn and requires very little equipment - just a tennis ball. Handball has existed in Australia since at least the 1920's. In 1928, the Australian Handball Council was formed. The game is said to help develop manual dexterity and gross motor skills. Handball is similar to squash, only players use their hand instead of a racquet (hence the name). You can play with one to four players. 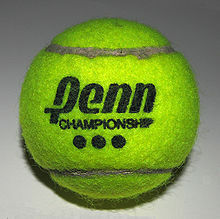 Players can play individually by bouncing a tennis ball against a wall. The ball must bounce on the ground at least once before hitting the wall. To make the game trickier, you can make up rules about how many times the ball must bounce or how close to the wall you're allowed to stand. For a two player game, you will need a large, concrete playing area. Draw a line across the middle of the space, dividing the area into two (like a tennis court without a net). The rules are the same as playing solo - the ball must bounce at least once before travelling into the opponents space. If the ball does not bounce, or if it bounces out of the playing field, the other person scores a point. A four player version exists where the field is divided into four courts, each of which are labelled king, queen, jack and dunce. If a player gets out, he or she moves down one square. If a player gets out whilst on dunce, they are out of the game. Because handball is often played in parks, schools and other high traffic areas it is important to mention the Interference rule. If someone or something threatens to disrupt the game, a player can call out 'Intos!' and stop the game until the disruption is removed. Handball is the ultimate activity for the reluctant sportsman - exciting without being too strenuous.